The 8 per cent VAT president bill passed and Kenyans will cough more to sustain the government debts - Bana Kenya News, Real African Network Tubanane. 8 Per cent VAT bill passed by the Kenya national assembly. President Uhuru Kenyatta will, therefore, sign the 8 Percent bill and be implemented. 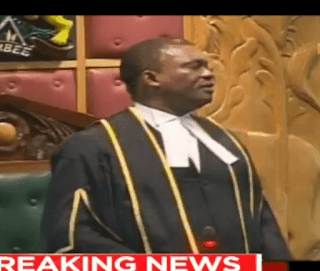 The deal between the President and the opposition leader has been executed and the division of the MPs seen as they shouted "Muturi must go"
According to the constitution, the legislature threshold for shooting down a bill is 233 out of 390 MPs. The Assembly had 2015 MPs which made the bill passed by default. Kenyans took to social media claiming that the Legislature has laid them down to their knees and hoping the government will have mercy on them. The afternoon session was chaotic but it didn't assist the Kenyans. There was a 30-minute standoff in the parliament and as the Speaker Justin Muturi tried hard to control the assembly. The President Uhuru Kenyatta and Raila Odinga handshake have worked on the favour of the Government than the Kenyans.